The Dollar Index is up 0.15%, looking towards a higher weekly close. Risk-on sentiment returned and gold is trading 0.7% lower. World equity markets are in green. NYMEX WTI Crude marches higher 0.75% to trade near $52.50 a barrel. 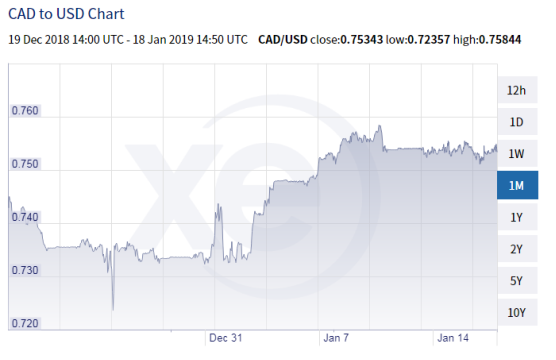 The Canadian loonie is trading in a consolidation zone over the five sessions after appreciating nearly 3.5% since the beginning of the month. Recent moves have been closely linked to ongoing partial government shutdown south of the border and higher oil prices. Recent data also points to inflation creeping higher and may push the Bank of Canada to revisit its monetary policy at its next meeting (March 6th). The US dollar is set to make a higher weekly close for the first time this year. The DXY index jumped after reports (later denied) surfaced that the US Administration will be removing Chinese tariffs to ease trade tensions. The government shutdown continues, and the weekend could be crucial to final a resolution to ongoing political bickering. China is also releasing heavy-duty data points about retail sales, unemployment and industrial production numbers over the weekend which could generate more volatility. Sterling is trading lower this morning on profit-taking moves. NYMEX WTI Crude oil is up 1.23% on new trade optimism, adding to buying interests for commodity currencies. The British Pound is under some selling pressure this morning with a bout of profit-taking activities. GBP/USD had earlier rose to its highest level in nine weeks. Expectations are running high that the UK government will concoct a new Brexit deal that will get Parliament approval and agreeable to the EU. Unless Brexit goes to another referendum or is delayed, the EU on March 29 and with time running out, an extension to the exit date could also be one of the many options. Meanwhile, retail sales came lower than expected, shrinking 0.9% in December 2018 compared to the previous month. The annual growth rate for 2018 (+2.7%) revealed a market slowdown compared to the peak of 4.7% experienced in 2016. The EUR/USD is still in consolidation mode, oscillating around the 1.14 mark for the third session in a row. Lack of strong data out of the Eurozone has motivated investors to remain on the sidelines, avoiding any heavy directional bets. Moreover, the recent economic numbers have highlighted weak fundamentals and the ECB is expected to keep its current monetary stance past the coming summer. The Consumer Price Index in Canada rose 2.0% on a year-over-year basis in December, following an increase of 1.7% in November. The latest figures released from Statistics Canada showed higher prices offset all lower energy prices in other services. USD/CAD is trading around the mid-point of 1.32 and continues to trade inside a consolidation range. AUD/USD moved in a tight range and with a negative bias today as talks about interest rate cut swirl around in the market. The Aussie fell 0.3% against the greenback this week on lower inflation expectations and deteriorating consumer confidence. The USD/JPY received a shot in the arms after reports broke out that the US could lift tariffs on Chinese imports, removing fears of a stalled trade negotiations. The pair jumped to a high towards the mid-point of 109, its highest level since January 2nd. Japanese data continues to disappoint with inflation growing at an anemic rate of 0.7% and industrial production down 1.0%. There is little on offer from the US calendar amidst partial government shutdown though we could see some volatility with Chinese data due this weekend.